As a general rule of thumb... same roads, same rules! It's important to know laws and policies can change at any time. We strongly encourage staying on top of the current Utah electric bike laws as this new riding technology progresses. 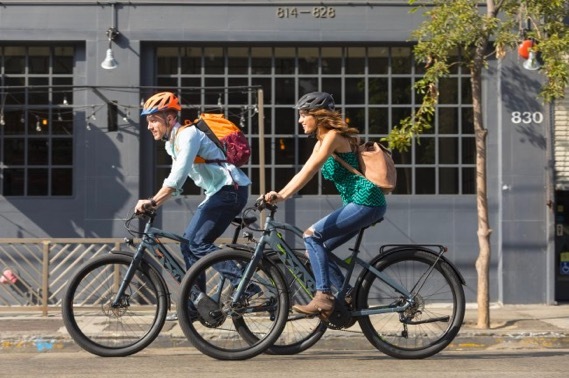 Always check with the City, County, State and other local agencies for the most current laws governing the legal use of electric bicycles in your area. Same rules as a non-powered bicycle. People riding bicycles on the road must follow the same laws as motor vehicles and may be subject to tickets and fines. Ebikes are not subject to the registration, licensing or insurance requirements that apply to motor vehicles. Ebikes are allowed on bike paths but not on sidewalks. Federal, state, county overrule local land laws and/or permissions. eMTB's may not be allowed on trails managed for non-motorized activities. Do not ride your eMTB in areas where the local rules are unclear. Better safe than sorry! Local land rules change frequently. When in doubt, ask your local land manager about access to specific trails. The state of Utah does not have licensing and registration requirements for electric bikes 20 miles per hour and under. Helmets are required for bike riders under 18 years old. We're all about safety and encourage riders to always wear their helmet anyways! Electric bikes are allowed on all roads as far right as possible, except when making a left turn. Electric bikes are allowed on bike paths and trails unless posted otherwise. Click here to view where you can ride!